The Aldrich Contemporary Art Museum is pleased to present the first museum survey of the work of the trailblazing artist, feminist and lesbian scholar, curator, activist, and author Harmony Hammond. Spanning almost fifty years, 1971 to 2018, the exhibition will bring together her earliest painted sculptures and sculpted paintings, mixed-media and monumental “installational” paintings of the 1980’s and 1990’s, and recent thickly painted “near monochromes,” as well as works on paper, ephemera, and publications. Harmony Hammond: Material Witness, Five Decades of Art will be on view at The Aldrich from March 3 to September 15, 2019. Harmony Hammond will be in conversation with art historian Julia Bryan-Wilson from 3:30 to 4:30 pm during the exhibition opening on Sunday, March 3. This survey will re-present the Presences (1972) and the Floorpieces (1973), two historic installations that Hammond created shortly after moving to New York in 1969. The Presences were featured in her initial solo exhibition (1973) at A.I.R., the women’s cooperative gallery in New York, which she co-founded in 1972. Larger than life-size, they resemble bodies or ceremonial robes—powerful three-dimensional accumulations assembled from “rags” (discarded fabric collected from female friends) that she dyed and painted with acrylic. Hammond has described the Floorpieces as her “most radical works,” as they “negotiate a space between painting and sculpture” and “between art and craft.” Their circular braided forms reference rag rugs, but are subtly oversized. Hammond braided knit fabric (scavenged from city dumpsters in the garment district south of Houston Street), stitched the braids into coils, and then partially painted the surface with acrylic, leaving sections of the colorful and patterned fabric uncovered. Considered as very flat sculptures or paintings, presented off the wall, five of the original seven Floorpieces will be installed together for the first time at The Aldrich in a double-height gallery, offering an expansive aerial view. 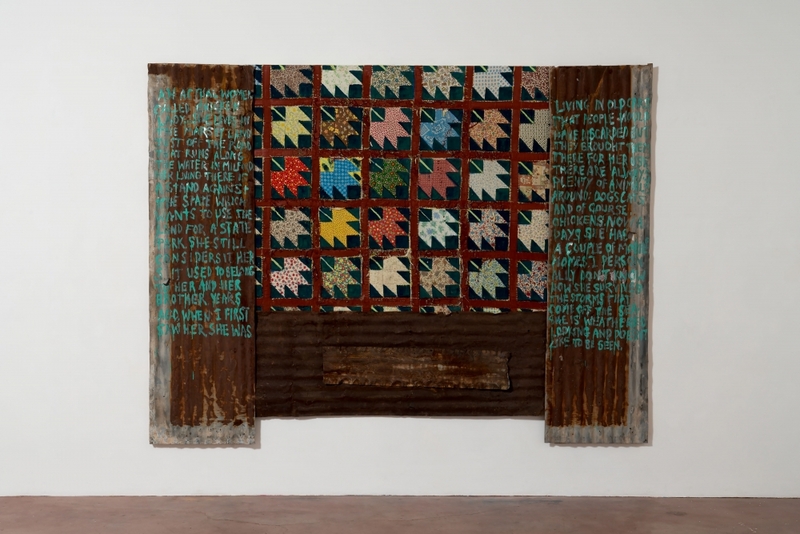 The mixed-media painting Chicken Lady (1989), which includes an old quilt and recycled rusty roofing tin, refers to an eponymous woman who lived with her animals in old cars and trailers on the marshy land along the waterfront in Milford, Connecticut. The work raises issues of gender and class—the homeless, the misfit, the alien, the artist—the female outsider who cannot participate in society, or chooses not to. Similar concerns continue in Hammond’s materially informed paintings of the last decade, which incorporate pieces of rough burlap, straps, grommets, and rope with her signature layers of thick paint. Often referred to as social or queer abstraction, these paintings engage formal strategies and material metaphors suggesting possibilities of restraint, connection, and liberation. Harmony Hammond (b. 1944) was a prominent figure in the development of the feminist art movement in New York in the early 1970s. Besides her being a co-founder of A.I.R. and the journal HERESIES: A Feminist Publication of Art & Politics (1976), she is the author of Wrappings: Essays on Feminism, Art, and the Martial Arts (TSL Press, 1984), considered to be a seminal publication of 1970s feminist art; her groundbreaking book Lesbian Art in America: A Contemporary History (Rizzoli, 2000) received a Lambda Literary Award. Hammond attended the University of Minnesota from 1963 to 1967, and moved to New York City in 1969. Since 1984, she has lived and worked in New Mexico, teaching at the University of Arizona, Tucson, from 1989 to 2006. In 2013, Hammond was honored with the College Art Association’s Distinguished Feminist Award. Her work has been exhibited nationally and internationally, in institutions such as the Museum of the City of New York (2016); New Mexico Museum of Art, Santa Fe (2016); Museum Brandhorst, Munich, Germany (2015); Rose Art Museum, Waltham, MA (2015); RedLine Art Space, Denver, CO (2014); National Museum of Women in the Arts, Washington, DC (2011); MoMA PS1 (2008); Vancouver Art Gallery, Canada (2008); Museum de Arte Contemporáneo Internacional Rufino Tamayo, Mexico City (2007); Neue Galerie, Graz, Austria (2007); Museum of Contemporary Art, Los Angeles (2007); SITE Sante Fe, NM (2002); Hammer Museum, Los Angeles (1996); Brooklyn Museum, NY (1985); New Museum, New York (1982); Downtown Whitney Museum, New York (1978); Walker Art Center, Minneapolis, MN (1968); among others. Hammond’s work is in the permanent collections of the Metropolitan Museum of Art and the Museum of Modern Art, New York; the Brooklyn Museum; the Walker Art Center, Minneapolis, MN; the Art Institute of Chicago, IL; and the Phoenix Art Museum, AZ; among others. She is represented by Alexander Gray Associates in New York. A full-color scholarly publication, with an essay by the curator, will be available during the exhibition. This book will be the first hardcover monograph of Hammond’s work. To celebrate the opening of the exhibition on Sunday, March 3, 2019, The Aldrich will be providing a shuttle service from New York City to the Museum in Ridgefield, CT. More information on the shuttle service.